The key to staying within your travel budget is to actually track your travel expenses. These apps and ideas should help! Are you interested in exploring the outdoors? Caroline explains why A Woman’s Guide to the Wild is perfect for females who are new to camping and hiking. Should you tip for luggage help? How much should you tip? 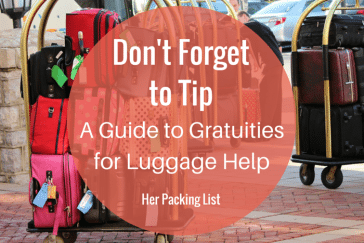 Our guide to gratuities for luggage help explains when and how much to tip for luggage. Traveling on your period can be a real hassle but it shouldn’t stop you from going and having fun. Here’s our guide to managing your period while traveling.